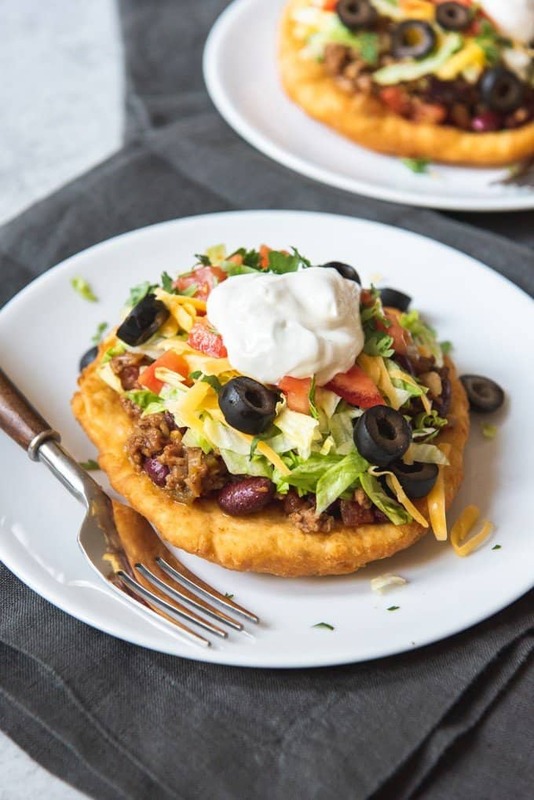 Deliciously crispy on the outside, soft and chewy on the inside, Navajo Tacos made with Indian Fry Bread are topped with a meaty mixture of taco seasoned ground beef and beans, then all the fixings like sour cream, shredded lettuce, cheddar cheese, and tomatoes! If you have never had a Navajo Taco before, now is the time to remedy that situation. The history behind this dish and the importance of the Navajo taco is something I was only vaguely aware of before deciding to make this as a recipe for my American Eats series while I’m looking at the favorite foods of the state of Arizona. Navajo Tacos were voted the State Dish of Arizona in a 1995 poll by the Arizona Republic newspaper and show up on many lists as one of the foods that Arizona is best known for. But I could have shared this for South Dakota, which declared Indian fry bread to be the official state bread of South Dakota in 2005, or Oklahoma, which is home to many Native Americans and hosts a large number of pow-wows each year where the Navajo Taco (sometimes just called an Indian taco, since it has been adopted and adapted by many tribes since it’s creation) is the most popular fare. This history behind Navajo fry bread is a painful one, as is much of Native American history. 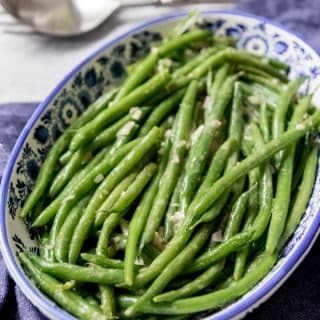 It was created in 1864 using the simplest of ingredients – the flour, salt and lard that was supplied by the United States government to the Navajo people of Arizona when they were forced to leave their historical homeland and march 300-miles by foot on a journey that has come to be known as the “the Long Walk” to New Mexico, where they were to resettle. The new land did not support their traditional staples of vegetables and beans, so the fry bread came to be a big part of their diet and culture. 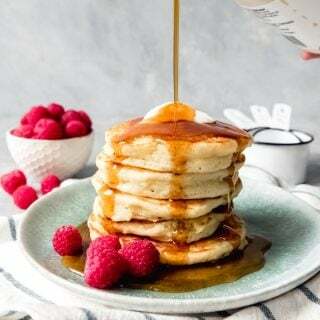 These large discs of fried dough can be served savory or sweet, take very little time to prepare, and are made with the same, simple ingredients as when they were first created. 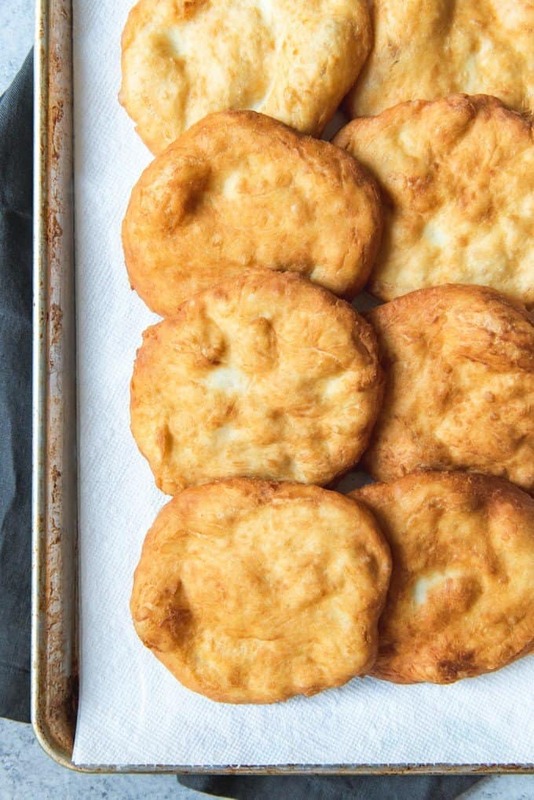 There are many ways and recipes for how to make indian fry bread. One way is to just use any regular bread dough made with yeast but instead of shaping it into loaves, pinch off small sections of dough and pat it out flat, then fry it. This is how I grew up enjoying indian fry bread – whenever my mom would make loaves of bread, she would pinch off dough and fry it up for us to enjoy hot with honey dripping all over it. 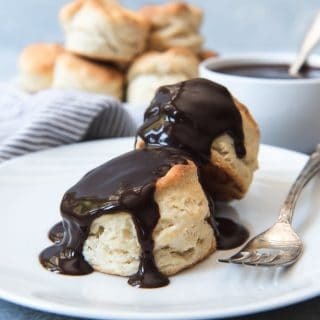 In Utah, these are called “scones”, which are nothing like traditional English scones whatsoever. You could even use thawed Rhodes roll dough or even canned Pillsbury biscuits that you just flatten out and fry. But really it takes hardly any extra time or effort to make fry bread dough (I have always used this Amish white bread, which is awesome for fry bread made with yeast) from scratch. 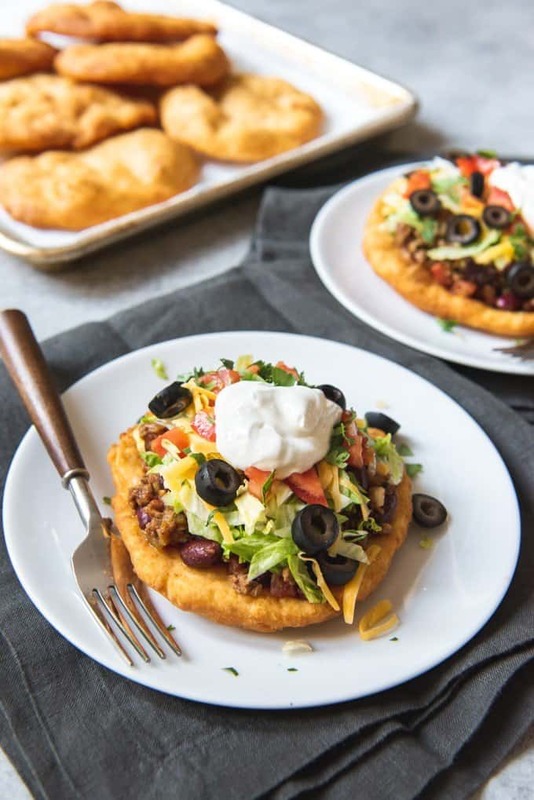 But traditional, authentic indian fry bread was made without yeast, and they are delicious too, with the added benefit of requiring a shorter resting or rising time. 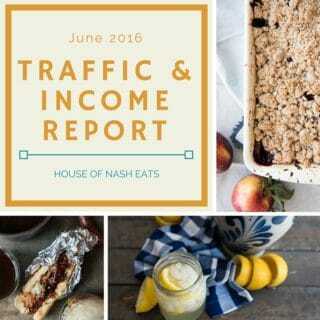 So that’s the version I’m sharing with this recipe today. 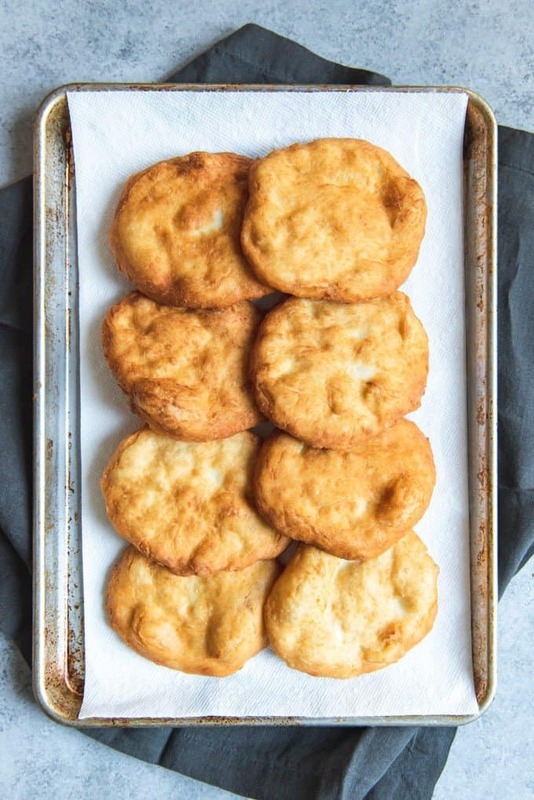 To make indian fry bread, you just mix together flour, salt, baking powder, and water, then let the dough rest for a bit before kneading it, letting rest for a few minutes, then dividing it into eight equal sections by pinching off golf ball-sized amounts and flattening them out. Then fry the discs of dough in hot oil for a few minutes. 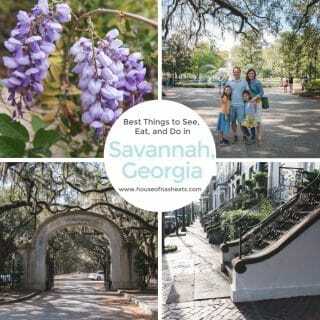 It is seriously so simple and so good! I just use my skillet and about an inch of oil to fry them, so it’s pretty easy clean-up. 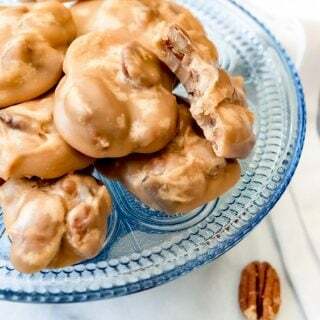 And while these are also good topped with honey for a sweet treat, they are traditionally served as a dinner item with meat, beans, and all the taco fixin’s you can think of. Really though, Navajo tacos are just as good with shredded beef, carnitas, chili, or pulled pork are the more traditional ground beef and beans. Basically anything you might otherwise put in a taco shell or on nachos is going to be tasty on this crispy, fried shell! 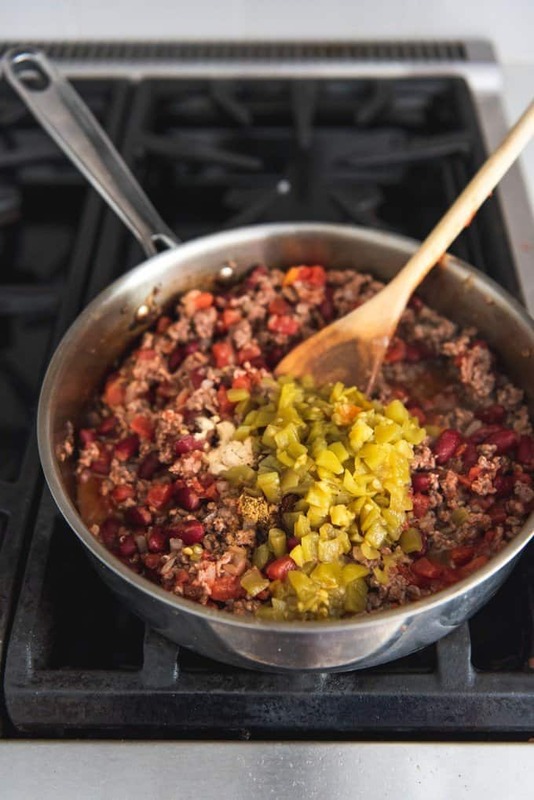 I’m including a meat topping option in the recipe today that is kind of a cross between taco meat and a chili that I think is really good, so you have lots of options to choose! 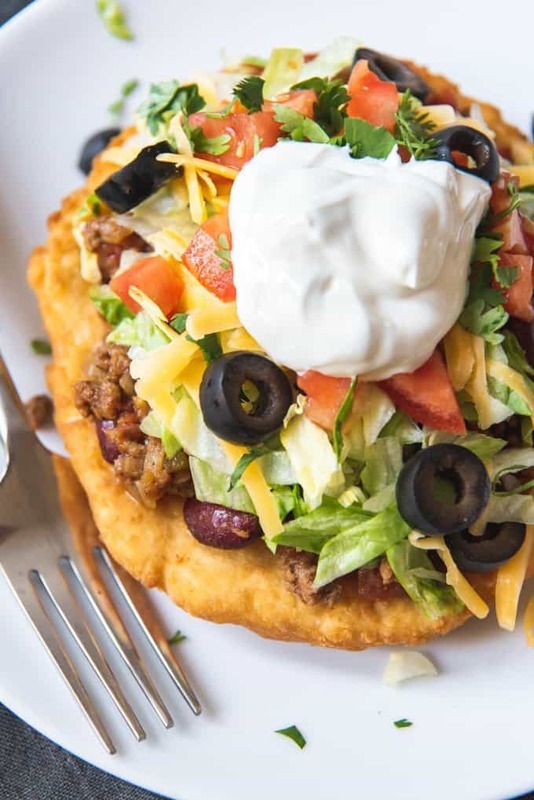 Serve it up with pico de gallo, lettuce, tomatoes, salsa, sour cream, cheese (anything from cheddar, to colby jack, to pepperjack, to cotija), black olives, green onions, sliced avocado and let family members create their own perfect Navajo taco! In a large bowl, combine the flour, baking powder and salt. Add the warm water and mix using a fork until a dough forms. Turn the dough out onto a lightly floured surface and knead for 5 minutes, then transfer to a clean bowl and cover tightly in plastic wrap. Let the dough rest for 10 minutes. 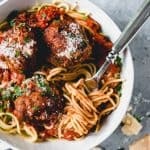 Divide the dough into 8 equal sections by pinching off golf-ball sized balls of dough, then pat and roll out the dough balls into roughly 6-inch discs on a lightly floured surface. Keep them covered with plastic wrap while you prepare to fry them. Heat 3 cups of oil in a large skillet or frying pan over medium heat for about 5 minutes until the oil temperature reaches between 350 and 360 degrees F. Working in batches, fry each disc in the hot oil until the dough is golden brown on one side, then carefully flip with tongs and fry on the other side. 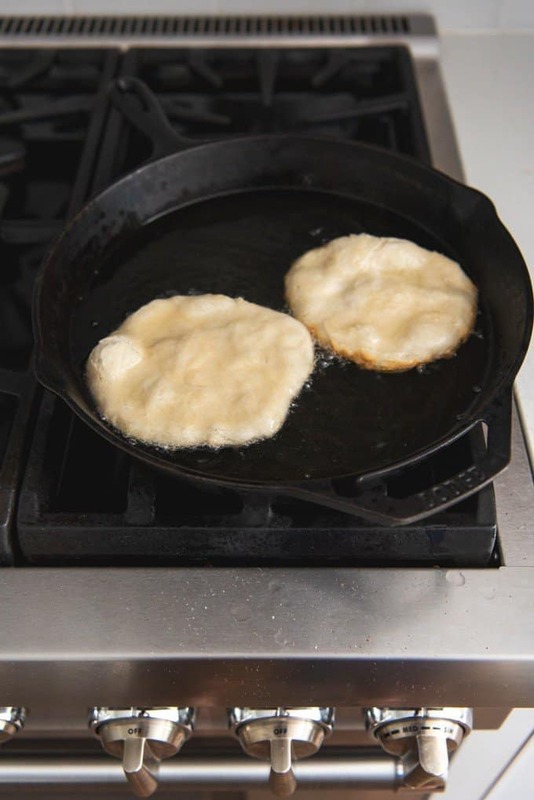 Set on a paper towel to drain oil and stick in a warm oven to stay hot while the other fry bread is cooked. In a large skillet, heat the oil over medium-high heat, then add the onions and cook for 2-3 minutes, just until they begin to soften. Add the meat and brown with the onions. 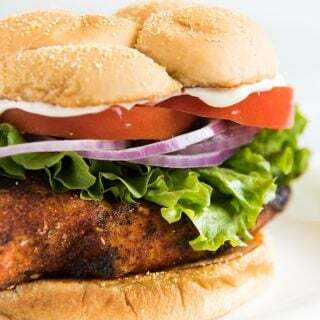 When the meat is no longer pink, add all of the spices, kidney beans, tomatoes, and chilies, and decrease the heat to medium-low. Stir everything together, then cover and simmer for 10 minutes, then use to top Indian fry bread for Navajo tacos. Add any toppings you like to the base of fry bread and taco mixture, piling it high. on inside. Having no point of reference for Navajo fry bread, I thought these were great. They were gone by the time I finished cooking. I’m glad you enjoyed these! Thanks for the review! I was wondering are the nutrition facts for the fry bread only or fry bread and topping? They should be for everything, but keep in mind that I’m not a food scientist or nutritionist or anything. I did the best I could using online tools for calculating nutrition. I was visiting my sister and her family in Texas for Christmas vacation. I was there for about a week and a half. 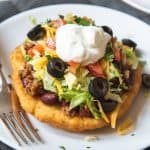 I decided that I would make some fry bread lost my recipe that I had came across this one super super easy everyone absolutely loved especially my niece. So easy. You could do so many things with this dough. This recipe was given to me by an old Navajo woman in Reno about 45 years ago. 1 tsp. baking powder…1/4 cup sugar….1 1/4 tsp salt…5 1/2 cups flour. Dissolve yeast in the 1 cup of warm water, add egg, milk and sugar. Whip until foamy. Add flour, salt and baking powder and mix to a thick dough. Cover and let stand for 15 mins. Roll out 1/4 in thick on a floured board then cut 4×4 inch squares. Fry in hot oil 400* to 500* degrees. Just till their a light golden and puffed up. Dough may be saved in a air tight container for up to 3 weeks and used as needed. 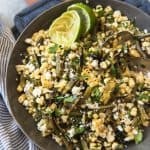 These look yummy, but wasn’t corn ever used? I don’t recall ever seeing corn included in Navajo tacos although I’m sure you could add it to all the other toppings. 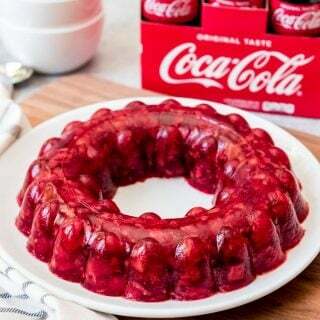 Want to thank you Madonna I find that very interesting an will have to try it. Also would like to thank Amy cause I used her recipe an turned out great. I live in a city with a large Native population and this is a staple at their church fundraisers. This recipe is very authentic tasting. Thank you!